I'm saddened to say that Art Morimitsu, long-time SoCal climber, known here as "trapeze artemis," passed away yesterday following a lengthy battle with cancer. Very sad news. I did not know Art really well, but I would run into him climbing all over the place. It was always a real treat to see him. He was a good climber who was modest, cheerful and supportive. Here's a shot I took of Art gracefully floating a route at Rock Creek, July 29, 2006. 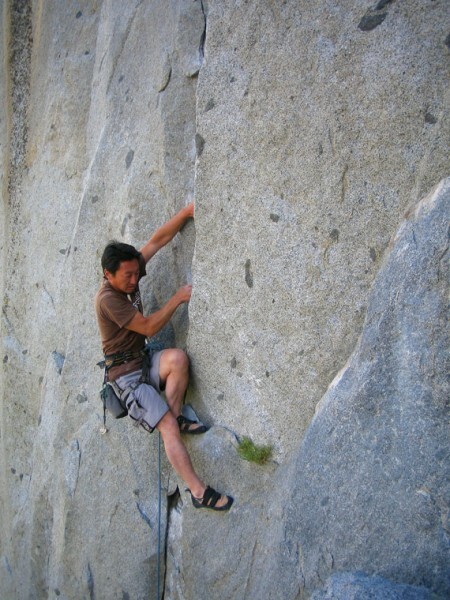 Art Morimitsu climbing at Rock Creek, Ca. July 29,2006. Please accept my best wishes to family and friends at this difficult time. this is so sad. i had no idea art was sick. i climbed black orpheus (redrocks) with art as well as a bunch of cragging at jtree w/ him. fun partner, lots of jokes and sh#t-talk. see you on the flipflop, artemis. Sorry to hear this, Jay. I figured you might have known him personally since you were both in Cali. He was pretty young too, I gather. About 30 or so? I lost a friend back in Austin who was 30 a few years back. It's pretty tough when you see such young people go at that age. Oh man! I haven't run into Art for years, but climbed a bit with him back about 10 years ago. Seemed like he was always in good spirits, was fun to be around, and had a healthy irreverence about him. He will be missed. Carry on in his spirit. Sad to hear it, also had no idea he was ill. Was just wondering recently why I hadn't run into him in a couple of years. Stich, I didn't know Art's exact age, but it was a lot closer to 50 than 30, believe it or not. He just always looked 20 years younger than his real age. Oh, I had gotten that information from somewhere and it was wrong. Regardless, 50 aint old. Art was one of my first J-Tree partners back when I started climbing in '02. Art and Tim Bui. Both great guys and wonderful mentors. Have a lot of fond memories of climbing with them and learning from them. Lost touch with him as the years passed. Had no idea he was sick. Always a smile and a psyched attitude from Art. Sad to hear it. He lived well by my estimation, good on him. Peace, all. Hello all, I went to school with Art. I am very sad to hear of his passing. He was a wonderful human being. He will be missed as much as he was loved... Alot! To his family... Thank you for having and sharing him with the rest of us! RIP Art!!! Met Art a few times...what a gentle man and wonderful spirit. When I met Art on one of my first trips to J. Tree he was living it up like a rock star. I never knew him well, but I used to run into him a surprisingly often considering how far apart we lived from each other. He was always stoked and friendly, and seeing him always brightened my day. I was so sad to read this this morning. To his close friends and family, I'm so sorry. Thanks for posting it here, Jay. Very sad. Art was a great guy. My Supertopo handle was given to me by Art. I heard this news today as I headed out of Indian Creek. Art taught me to place gear and lead back in 2003, and I cherish and frequently use those skills. He gave me the black Metolius cam I fell on yesterday. Art and I went through a lot together. I wish I had stayed in better touch. I wish he had told me he was sick. Art, you are such a huge part of climbing to me. Art may have been small in stature, but not in heart or in spirit. I had great times climbing with Art, swilling tequila with him and starting fights with him vs. a certain JT motel owner (who shall remain nameless) and subsequently the San Bernadino County Sheriff's office which was summoned as reinforcement. Not surprisingly, we lost that one. I will miss him. Like others, it's been a few years since I've spoken to Art and I had no idea he was ill. Art was awesome. He'd tell it like it is, and held nothing back. If someone were being a jackass, he'd call them out to their face, much to the delight of the folks who were being negatively affected by the person's behavior as Art became their voice, the voice of truth. I learned a bit from Art when I was getting more into technical climbing; being new, I needed to be surrounded by people I could trust from a safety perspective, and he was one of those people. He was far from perfect, like all of us. Yet, there was a camaraderie and bond that comes from people you trust. Life here is short; thanks for the memories. RIP Art. Oh man...sad news.... )-: Condolences to his family and friends..